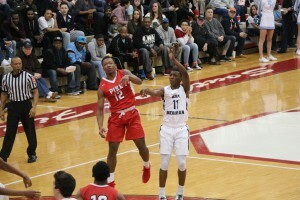 The tough night for Perry Township teams continued at the Southport Fieldhouse Friday night with Perry Meridian losing to the Pike 77 to 32 in the second semifinal game. Perry struggled to find its offense against a strong Red Devil defense. Perry Meridian fans and cheerleaders cheered on the Falcons but it just wouldn’t be their night. Falcon fans were looking for another upset after beating Franklin Central earlier in the week. Perry’s next game is Wednesday at home against Greenwood. For several more pictures of game highlights log onto the Perry Township Schools Facebook page.